Inform the students about the S.B.A , see About the S.B.A. Place the students in groups OR facilitate students formin groups of 4-5. Assist the groups' formulation of a theme, topic, issue or event. Educate the students about research methods. Assist the formulation of a Plan of Investigation, by each student. Assist each student in reflecting on three sources. Assist the S.B.A groups to produce written reports on the S.B.A processes and procedures. Assist students in preparing speeches. The first step in the S.B.A process is to either place students in groups, or allow the students to choose the groups that they join. The creation of a table, at this point, becomes helpful because it organizes the teacher, and, by extension, the groups. The table should, after the formation of the groups, contain (www.bulbsoup.com) important information, such as: the the theme/ event of the group, individual students' names, the individual topic of each student, e-mail address of each student, and the contact number for a parent. ​THEME - 1. A subject of discourse, discussion, meditation or discussion, topic. 2. A unifying or dominant idea, motif etc. TOPIC - 1. A subject of conversation or discussion. 2. The subject or theme of a discourse. EVENT - 1. Something that happens, or is regarded as happening; an occurrence, especially one of some importance. 2. Something that occurs in a certain place, during a particular interval of time. Please note that the process of formalizing a theme, topic, or event for the various groups might take approximately 2-3 weeks. Good luck! Before the PLAN OF INVESTIGATION is explored, it is necessary to discuss research methods. This is the means by which the students will acquire the data for their particular topics, which will feed into the general group theme. 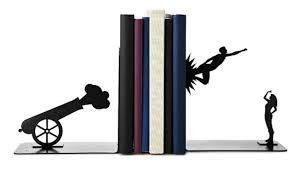 The student should research, and use secondary sources. This is any type of research in which information from an existing research, that others have gathered through primary research methods, is used. Secondary research (www.bulbsoup.com) material can be obtained in books, magazines, biographies and newspapers, and is probably the easiest, of the two, to conduct. These material can be accessed from the internet, or directly from the tangible source. A possible first step to writing the plan of investigation/ introduction, is to allow the student to fill out a form that specifies the exact information that is needed for this portion of the S.B.A. The advantage of doing this is that you, the teacher, will get an idea of the students thought process in a manageable format, that is easy to correct. 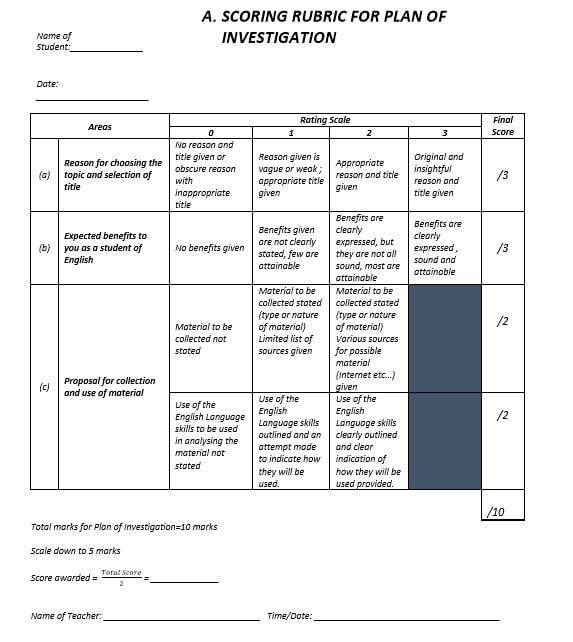 After each student's Plan of Investigation form has been corrected and returned, the student can use their form to produce the introductory paragraph. It should NOT exceed 100 words. The requirements for the maximum score is that the student must clearly state the title of the topic and give an insightful and original reason for embarking on their research topic. Therefore, the student cannot simply state that they are interested in the topic. This response is neither original or insightful. The online (www.bulbsoup.com) dictionary defines insightful as 'having and showing an accurate or deep understanding' while original is 'created personally, not a copy'. Therefore, if the topic of the research is 'The impact that dancehall music, played loudly, has on a community', the student needs to state some personal interest in it, possibly based on an experience that they have had, not simply state that they are interested in the topic. This will satisfy the criteria for 'original' and 'insightful'. The students' answers, at this point, must be specific. He or she must relate this answer to an English Language or Literature skill that will be accessed, or sharpened, during the process of the research. Here are some possible options, based on the CSEC syllabus' aims. develop/ enhance the ability to use Standard English. develop/ enhance the ability to edit and self assess. develop the ability to inform myself about social issues and to contribute reasoned opinions on said issues. facilitate an understanding and appreciation for the place and value of varieties of English and the dialects and Creoles of the Caribbean and other regions. develop the capacity to assess the reliability of sources, especially those found on the internet. *The Plan of Investigation is literally a plan that outlines HOW the student plans to proceed with the S.B.A. It is not a conclusion, so it so it should not be done at the end of the process of writing the S.B.A, but at the beginning. Whether or not the intended process, outlined in this Plan of Investigation, were achieved will be analysed in the processes and procedures section of the written report. It is important that, after each draft of the Plan of Investigation is returned, a log of dates is kept. The dates should be verified by both the teacher and students. It is also advisable that the teacher collects both a soft copy and a printed copy of the final draft of the Plan of Investigation. Establishing ownership of work done - This form is to be completed during, and upon completion, of all the sections of the S.B.A that was done in the presence of the teacher. Therefore, this form should be completed at the end of the Plan of Investigation, the three Reflections and the Written Report. Each students should fill out, sign, and hand in this document to the teacher, upon completion of the before mentioned sections of the S.B.A. Please see page 47 in the Syllabus. Student Schedule - This form is to be completed, by the S.B.A groups, before each section begins. Therefore, this form is to be completed before the Plan of Investigation, the three Reflections and the Written report. The group members should discuss and fill out this form, and the group leader (at the time) should sign the document after the group has fully discussed, and decided on their action plan. This document should be handed up to the teacher. Please see page 48 in the Syllabus. Plan of Investigation - This is where the student produces an introduction to the research. It basically gives the examiner a chance to see how the student plans to research the personal topic, which is under the umbrella of the group theme. Sign up for bulbsoup membership and access more information ... scroll down the page and click the membership button today!